Fig. 1: A double-slit apparatus suggested by Niels Bohr to demonstrate the wave-particle dualism (from N. Bohr 1949/1983: Discussions with Einstein on Epistemo-logical Problems in Atomic Physics, p. 27). Fig. 3: Schematic representation of an experimental molecular double-slit experiment with combined electron and fragment ion detection. The experiments were partly performed behind the soft X-ray beamline BW3 of HASYLAB. The molecular double-slit has two setting possibilities described by |g> and |u> as shown in figure 2. Depending on the setting, one receives characteristic angular pattern which correspond to fringes and anti-fringes in Young’s double-slit experiment. One of the most counterintuitive aspects of quantum physics is that for some scenarios which are perceived as “either or” in everyday life, there is also the "as well as" possibility. A natural example of such behaviour, however, has now been seen in molecular nitrogen where each electron, even a highly localized core electron, is on both atoms of the molecule at the same time. When the molecule is ionised, this gives rise to coherent electron emission from both ends of the molecule, as in the single electron double-slit experiment. This coherent character of electron emission in such molecules has been demonstrated for the first time by scientists from the Fritz-Haber-Institute using ionizing radiation from synchrotrons at HASYLAB (DORIS III) and BESSY. They could also show that distortions of the mirror symmetry in these molecules by isotope substitution lead to a loss of coherence, due to partial localisation of the electron at one atomic site. 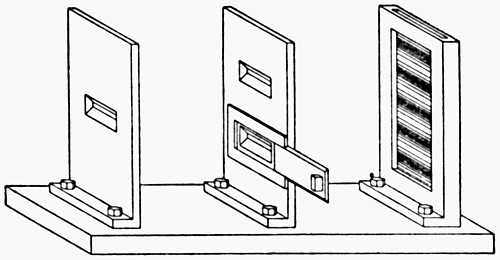 The show case example of a double-slit experiment is the one performed by Thomas Young back in 1805 giving this kind of experiment its name, Young’s double-slit experiment. Coherent light is passed through a barrier with two slits. On an observation screen behind it, a pattern of light and dark stripes emerges (Fig. 1). The experiment can be carried out not only with light, but also particles - for example, electrons. If single electrons are sent, one after the other, through the open Young double-slit, a stripe-shaped interference pattern appears on the photo plate behind it. The pattern contains no information about the route that the electron took. But if one of the two slits is closed, an image appears of the other open slit from which one can directly determine the path of the electron. What this experiment does not produce, however, is a stripe pattern and "which way" report at the same time. That requires a molecular double-slit experiment based not upon position-momentum uncertainty, but on mirror, more precisely, inversion symmetry. The double-slit with electrons was voted the most beautiful experiment of all time in a 2002 poll by Physics World, published by England’s Institute of Physics (1). Although each electron seems to go alone through one of the two slits, at the end a wavelike interference pattern is created, as if the electron split while it went through the slit, but then was subsequently re-unified. But if one of the slits is closed, or an observer sees which slit the electron went through, then it behaves like a perfectly normal particle. That particle is only at one position at one time, but not at both at the same time. So, depending on how the experiment is carried out, the electron is either at position A, position B, or at both at the same time. This "indeterminacy" in quantum physics is perhaps most famously symbolised by the paradox of Schrödinger's Cat. But Bohr’s Complementarity Principle (2), which explains this ambiguity, requires that one can only observe one of the two electron manifestations at any given time - either as a wave or a particle, but not both simultaneously. This remains a certainty in every experiment, despite all the ambiguity in quantum physics. Either a system is in a state of "both/and" like a wave, or "either/or" like a particle, relating to ist localisation. This is, in principle, a consequence of Heisenberg’s uncertainty principle, which states that for a complementary pair of measurements - for example, position and momentum - only one can be determined exactly at the same time. Information about the other measurement is proportionally lost. Recently there has been a set of experiments suggesting that these various manifestations of matter can be "carried over into" each other – in other words, they can be switching from one form to the other and, under certain conditions, back again. This class of experiments is called quantum markers (3) and quantum erasers (4). Researchers have shown in the last few years that for photons and atoms - and now, electrons - "both/and" and "either/or" exist side-by-side. In other words, there is a grey zone of complementarity. There are hence experimentally demonstrable conditions where matter appears to be both a wave and a particle. These situations can be described by a so called duality relation. It can be viewed as an extended Complementarity Principle for quantum physics; which should be more precisely called a Co-existence Principle. It states that manifestations of matter which would normally be mutually exclusive - e.g., local and non-local, coherent and non-coherent - are indeed measurable and make themselves evident, in a particular "transition regime". One can speak of partial localisation and partial coherence, or partial visibility and partial distinguishability. These are measurements that are connected to each other via the duality relation. In this transition regime the Complementarity Principle, and the complementary dualism should be extended to the more general Co-existence Principle, describing the parallel dualism of nature. Nature has thus a more ambivalent character than previously recognized. Atomic interferometry provides us with examples of this ambivalence. It was first found in 1998 in atoms, (5) which consist of an assembly of particles enabling internal degrees of freedom. In a recent issue of Nature Max Planck researchers in Berlin, together with researchers from the California Institute of Technology in Pasadena, California, report on a molecular double-slit experiment with electrons which are elementary structureless particles, not assemblies of particles, like atoms. Molecules with identical atoms, and thus inversion symmetry, behave like natures own microscopically small double-slit (Fig. 2). Nitrogen is one such molecule. In it, each electron - also the highly localised inner electrons – is simultaneously at both atoms. If we ionise such a molecule with soft x-rays, we end up with a coherent - that is, wavelike - strongly coupled electron emission from both atomic sites. This is exactly like a double slit experiment with single electrons. For the first time, the researchers were able to demonstrate the coherent character of electron emissions from such a molecule, in analogy to the double-slit experiment. 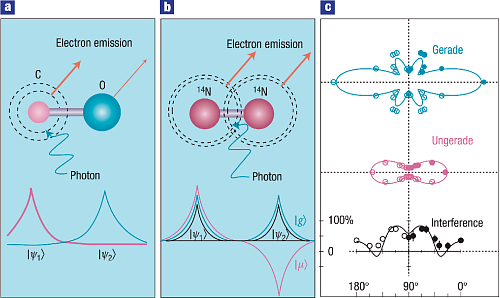 They used soft x-rays to destabilise the innermost, and thus most strongly localised, electrons of nitrogen from the molecule, and then followed their movement in the molecular frame of reference using electron-ion coincidence detection. In addition, the researchers were able to prove something that has long been doubted: a disruption of the inversion symmetry of this molecule leads to a partial loss of coherence through the introduction of two different heavy isotopes, in this case N14 and N15. The electrons begin to localise partially on one of the two, now distinguishable, atoms. This is equivalent to partially marking one of the two slits in Young’s double-slit experiment. It provides partial "which way" information, because the marking gives information about which path the electron took. The experiments were carried out by members of the working group "Atomic Physics" of the FHI at the synchrotron radiation laboratories HASYLAB at DESY in Hamburg and BESSY in Berlin. 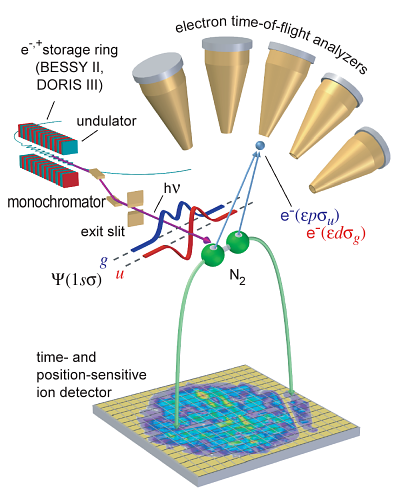 The measurements employed a multi-detector array for combined, coincident electron and ion detection behind what are called undulator beam lines, which deliver soft x-rays with a high intensity and spectral resolution (Fig. 3). Support for the working group of four scientists and three doctoral students came from the Max Planck Society and also largely from the Federal Ministry of Education and Research, under the programme promoting research in specially chosen topics on fundamental principles of the natural sciences.